I’m excited and honored to be a part of The Pulse: Artist Registry, a huge project undertaken by Seth Apter at The Altered Page, in which he has interviewed 95 artists and will feature their answers to a series of questions in future posts in his blog. This link takes you to the beginning, and includes a comprehensive list of links to all the participating artists. Seth has amazing energy and imagination, and I always love reading his blog. The Echoes Series consists of texture, lots of layering, and more texture, and with a twist: I’ve started playing with interference colors. This will be something I’ll have to be very judicious and careful with. They are way too addictive! Like garlic, a little goes a long way. Beautiful! I love the textures and colors, particularly on the right (though the left side is great also!). Great use of interference colors – I can see they could be tempting as they produce such a unique color palette, but might be distracting if overused. But this works wonderfully. I particularly like the way in which you’ve split the piece – it provides a formal geometric template in which the more random textures and colors reside. A really nice design complement. Thank you for the comments, Bob. It’s interesting to me that a divided composition is somehow more comfortable than a wide open expanse of canvas. It definitely keeps things under control. I just discovered your blog by accident..or I should say serendipity..We have a similar blog name. I enjoyed looking at your art throughout your blog. 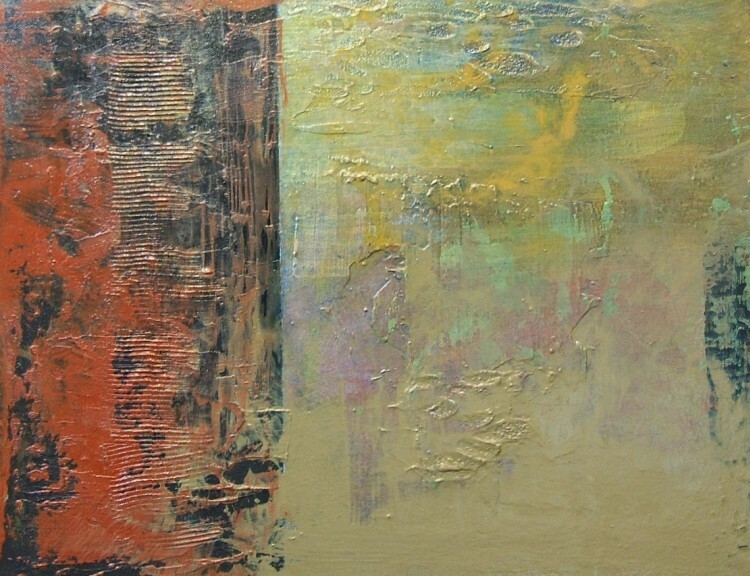 Great use of color and texture..Your ways of expression are familiar to me and therefor feel warm and close. I’m so glad I found you..I’m going to subscribe to your blog and visit it often. Orly, so nice to meet you. What a beautiful blog! I hope all my readers check it out. Thank you so much for visiting. I look forward to many exchanges of ideas. Thanks for the link to The Pulse and for your generous words about me and my blog. I am so happy you are a participant in they survey. Also, I love this piece. There is something really compelling about serving up a diptych within the confines of a single frame. Thank you Seth. I meant every word. Glad you like the painting!